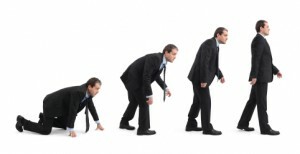 According to Merriam Webster, by definition, evolution is “a process of continuous change from a lower, simpler, or worse to a higher, more complex, or better state.” The world of marketing has been evolving from the beginning – changing from the simplicity of the first newspaper ad to appear in a French periodical in the 1700s to the complicated multi-platform integrated processes of today. So, when it comes to “evolution”, B2B marketing has indeed changed from simpler to more complex methods and while the positives and negatives of each method along the timeline are subjective, the one constant is that they are indeed changing. To be able to look into the future and where things are going for B2B marketers, it is good to look in the past and where they came from in order to learn and grow your marketing plans going forward. Sales Centric: The initial breakthrough on the path to modern marketing was Gutenberg’s printing press. It had the ability to print exponentially faster than any previous technique which made the production of the printed word, over time, a common occurrence instead of a rarity. Three hundred years later in the 1700s, there was the advent of the first magazine, and the first paid advertisement in a newspaper in France in the 1830s. Marketing, in the beginning, was focused predominantly on sales. Selling a product, plain and simple. This included posters and talkers, hawkers on street corners and direct branding. In the beginning there was a free for all approach – someone selling a product would do everything they could to sell it and that included exaggerating features, making outrageous claims or downright falseness. This was a time before there were regulations or structure. It also was a time of new ideas and innovations in the industry, leading towards a new era of marketing. Buyer Centric: The 20th century brought about the advent of radio advertisements, television, and computers. A new direction in marketing had marketers telling buyers what they needed rather than asking what they wanted. There was a new and overwhelming amount of media with the advent of so many different platforms to connect on. People were always being told they needed something new and businesses were taking advantage of being able to overwhelm their senses. This was a time when marketing became less about the product and more about the target audience and how to reach them. At this time, marketing was still focused mainly on the relationship between business and customer and their psyche, the way they shopped, work, and played. The first ever TV advertisement was in 1941 for the watch company Bulova, at a cost of $9 for a 20 second spot whereas these days 30 seconds of television advertisement can cost upwards of fifty to one hundred thousand dollars depending on the day and time. So, with the internet fueling a path towards interconnectedness when it comes to marketing, what does this mean for B2B marketers and their approaches? We believe evolution in the B2B marketing world is moving faster than ever and new innovations are around every corner. What do you feel will happen in the future of B2B marketing? Share with us in a comment!